The Syrian regime of President Bashar al-Assad is set to launch “Russia’s war” on the opposition imminently. Leading political analyst and commentator Abdelwahhab Badrakhan, writing today for pan-Arab al-Hayat, expects the U.S. to continue sitting on the bench without a sound. Why did the Russians and Lakhdar Brahimi suddenly try to hard sell a “political solution” in Syria before bungling the attempt altogether? Why did the joint UN-Arab League Special Envoy’s style metamorphose into Sergei Lavrov’s? The answer is the U.S.-Russian understanding reached by the Russian foreign minister and U.S. Secretary of State Hillary Clinton in Dublin last December 7. The U.S. Administration wants to preempt any development that would force it to ultimately intervene in Syria. U.S. promises of financial aid and advanced weapons to the Syrian opposition to set up the Syrian National Coalition of Revolutionary and Opposition Forces proved to be a honeytrap. All Syrian opposition sources now confirm financial and military support by other “Friends of Syria,” which started falling off last August, dried up completely after the umbrella group was formed last November. Washington’s priority has invariably been a political deal between the opposition and members of the government who “do not have blood on their hands” followed by Assad’s exit, albeit after a few months. Moscow’s argument was that a settlement without Assad and his cooperation is unworkable and the priority is to restructure the army and security services. Brahimi took the U.S.-Russian understanding and communicated to Assad in Damascus. The latter chose to first discuss his answer with Russia first. Feisal Mekdad flew to Moscow to say his boss refuses to transfer his powers and is bent on completing his term and on running for reelection in 2014. Moscow tactlessly hastened to throw the ball into the Syrian opposition’s court. In response, it got an undiplomatic answer from the opposition leader. After marginalizing the opposition, Russia and Brahimi asked it to sit at the conference table with a regime they knew was unwilling to compromise. Having played the first round of middlemen with the U.S. sitting on the bench totally silent, Lavrov and Brahimi upped the ante. They blurted out scaremongering remarks about “hell,” “Somalization” and “100,000 deaths,” knowing all too well the regime doesn’t care and the opposition won’t be cowed. With neither the regime nor the opposition ready for a deal, the Russians and Americans plan to resume their consultations on Syria. Most probably, they will agree to sit back and let the two sides fight it out until sheer exhaustion forces them to sit and talk. Before long, the regime will be fighting Russia’s war. Moscow wants the regime to go all out and change the balance of forces on the ground in the weeks leading up to its new round of consultations with Washington. It will accordingly cover the regime’s overt reliance on Iran and Hezbollah. 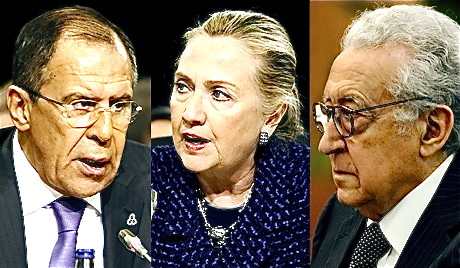 Will the U.S. administration have something new to tell Lavrov and Brahimi at the new round of talks? No. Washington said what it wanted to say on the eve of the “Friends of Syria” conference in Marrakesh, when it designated Jabhat al-Nusra a terrorist organization. The designation expressed the U.S. position on Syria much more accurately than its recognition of the opposition Coalition the next day. The Obama administration’s approach is to avoid the Iraq experience in Syria. Washington, which almost regrets toppling Saddam Hussein, is very nearly reprieving Assad.